I adore glitter topcoats, especially those with multi-shaped and hex glitter. So when I saw this little collection of 2 glitter topcoats, I was so excited to try it. I reviewing this, I decided to follow Nubar's own PR information and swatch the black dots on white and the white dots on black. For the white and the black base coats, I used OPI Alpine Snow Matte and Color Club Bewitched, respectively. 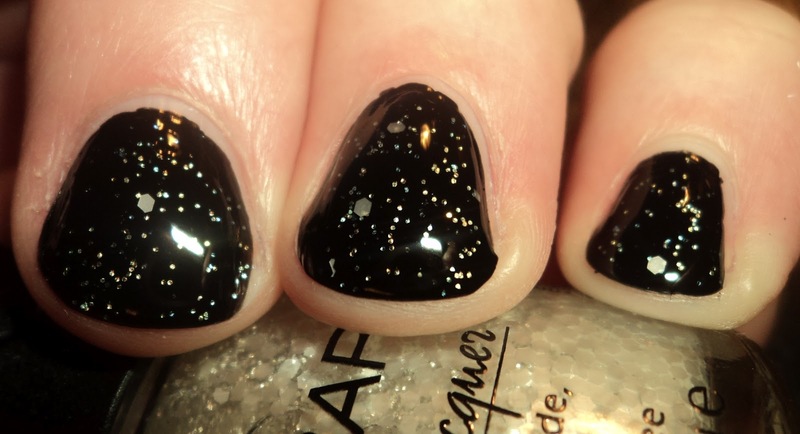 Black Polka Dot (over white) - black, multi-shaped glitter in a clear base. I love this one and it's my favorite of the two. I love the look of it over white, but I think this would look fabulous on just about any lighter shade (imagine this over pale pink or mint green). This is 3 coats of Black Polka Dot because I wanted to make sure I had the right amount of little glitter and hex glitter, but you can use as much or as little of this as you like. Application was great, and I had no glumpyness or glitter drag. 3 coats. 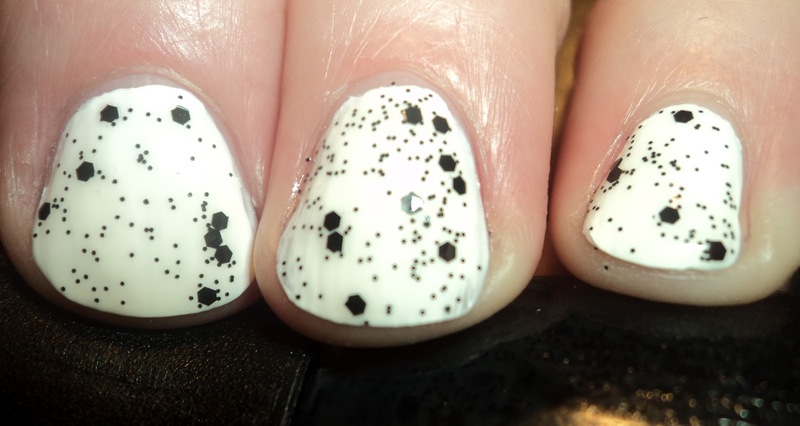 White Polka Dot (over black)- silvery-white multi-shaped glitter in a clear base. On the nail, this one comes across to me as being more of a silver than a white, but in the bottle, it definitely looks more white. While I did prefer Black Polka Dot, I loved this one as well, and think this would look amazing over navy. Also, I wanted to add that when I wore this out in the sun later on in the day, the smaller glitters looked blue and green, so I'm not sure if it was meant to do that or if was maybe something to do with the base color, but I did not see any blue or green in the bottle. Application was just as great as it's sister. 3 coats. Also, while I don't have a picture of it, you also get a bottle of Nubar Diamont with this little collection. Normally, I don't use a topcoat when I swatch, but in this case, I did, because I wanted to see how Diamont performed. I know in the past, people have had issues with Diamont, because at some point, there was a formula change. However, with this bottle, I had no issues, so they must have changed their formula back to the original formulation, because this one went on smoothly and was dry in minutes (I may actually LOVE Diamont now). I used Diamont over both of the swatches above. All in all, I really like these 2 glitter topcoats. They are so versatile, that I can't wait to see what I can layer them over. You can purchase these at Nubar's website. Price is $20 for the set which includes the 2 glitters, as well as a bottle of Diamont.